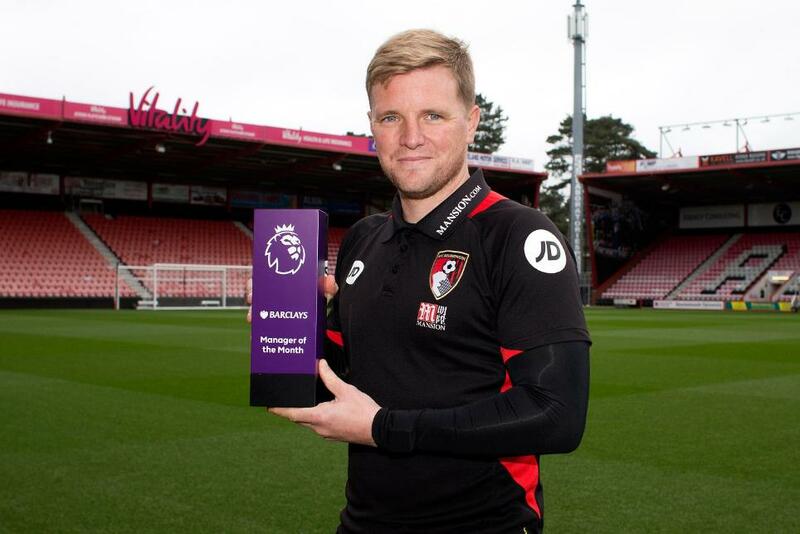 Eddie Howe has been named the Barclays Manager of the Month for the first time after masterminding AFC Bournemouth’s unbeaten Premier League run in March. The Cherries won two and drew one of their three matches to move up to 11th in the table and nine points clear of the relegation zone. Howe’s side started the month with a 1-1 draw at Manchester United, earning a first PL point at Old Trafford thanks to Joshua King’s goal and Artur Boruc’s penalty save despite being down to 10 men. A 3-2 home win against West Ham United then ended an eight-match winless run for the Cherries, who rounded off the month with a 2-0 victory over Swansea City, securing back-to-back PL wins for the first time since March 2016. "It feels really good," said Howe, who at 39 is the youngest recipient of the award since Garry Monk in August 2014. "It was such an important month for us. "The fact we were able to pick up seven points and go unbeaten means everything to us at this moment." Howe was selected by a combination of votes from a panel of experts and the public, beating five other contenders: Crystal Palace’s Sam Allardyce, Chelsea head coach Antonio Conte, Liverpool manager Jurgen Klopp, Tottenham Hotspur’s Mauricio Pochettino and Craig Shakespeare, of Leicester City.